The Paynesville Area Health Care System unveiled their newly-remodeled facility to the public last week with an open house and tours, capping a two-year, $8.2-million project. The project included four additions to PAHCS's clinic and hospital facility and extensive interior remodeling, including the first major renovations at the Koronis Manor, a 40-year-old nursing home. CEO Steve Moburg thanked the staff, patients, and the public for showing patience during the project and supporting PAHCS during the lengthy construction. Adding a second operating room and updating the OB services, among other improvements, were needed, said Moburg. "I think it is extremely important to stay current," he explained. "This allows us to stay competitive." Dr. Bob Glesne, a urologist based in St. Cloud who provides specialist services in the outreach clinic, complimented PAHCS for taking the risk and having the foresight to do the remodeling project. As a visiting specialist, Glesne uses both the new surgical suite and the remodeled outreach clinic. "They are state-of-the-art," he said. "They are fantastic." Both should give PAHCS room to grow, he added. 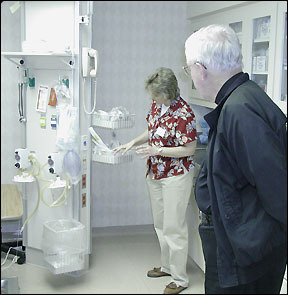 Registered nurse Sandy Hemmesch led a tour of the new emergency wing, showing Father Richard Leisen one of the three new trauma/procedure rooms on Wednesday, May 14. The Paynesville Area Health Care System held an open house to show their updated facility. The building project included four additions: a new emergency wing on the west side of the hospital; a new dining room for the Koronis Manor; new offices at the Paynesville Area Medical Clinic; and new meeting rooms and maintenance and storage areas. Extensive interior remodeling included the creation of three new birthing suites; the addition of a second, larger operating room; an expanded outreach (or specialty) clinic; a new front desk at the clinic entrance to provide more privacy; and a host of improvements at the Koronis Manor. In the new operating room, PAHCS can now do orthopedic procedures (hip and knee replacements). They have already had their first knee replacement surgery. In the outreach clinic, they nearly doubled the amount of exam and procedure rooms available to visiting specialists as well as to PAHCS's medical staff. And the outreach clinic no longer has to share space with the emergency room, since a new emergency wing was built. Ground was broken on the project in May 2001, and the work was expected to take 16 months. But the original plumbing contractor declared bankruptcy within a couple months, causing a delay of a month, and ventilation work at the Koronis Manor proved more complex than anticipated, and the project ended up lasting two years. Ventilation work in the Koronis Manor was expected to take two or three days per room but residents were actually out of their rooms for up to eight weeks. Patients, families, and staff need to be commended for their patience, understanding, and extra work throughout the construction and remodeling, said Bev Mueller, acute care administrator for PAHCS, who oversaw the project. As a health care facility, PAHCS had to continue to operate while construction was being done, making the project, and its timing, especially complex. 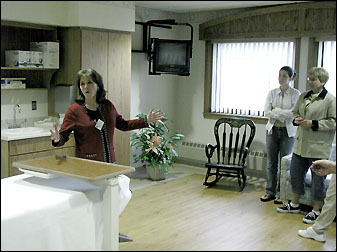 Registered nurse Amy Miller showed one of the three new birthing suites - designed for mothers to labor, deliver, and recover in the same room - to a group that included Anne and Mary Janotta. A big reason why PAHCS was always in operation was the flexibility of the contractors, said Mueller. It would have been impossible to continue to operate the facility without the willingness of contractors to perform the work at an optimum time for PAHCS. "The contractors were very good to work with us," said Mueller. The project cost also increased due to its complexity. Originally budgeted at $7.4 million, the final project cost is $8.2 million, mainly due to extra costs in the Koronis Manor, additional mechanical work, and new equipment in the operating room. A city-owned hospital was built in Paynesville in 1956, and a nursing home Ð the Koronis Manor Ð was added in 1964. No major improvements were made to the facility until 1983, when the hospital pods were added, the lab and x-ray departments were updated, and an outreach clinic was started. In 1987, 700 Stearns Place Ð apartments for independent senior living ÐÊwas added, and in 1995 a clinic was added to the facility. The remodeling project included the first major renovations in the Koronis Manor since it was built in 1964 Ð adding sprinklers, adding space in the dining room and tub rooms for wheelchairs, and redoing much of the infrastructure. The recent work was the second major renovation of the hospital, following a major project in 1983.